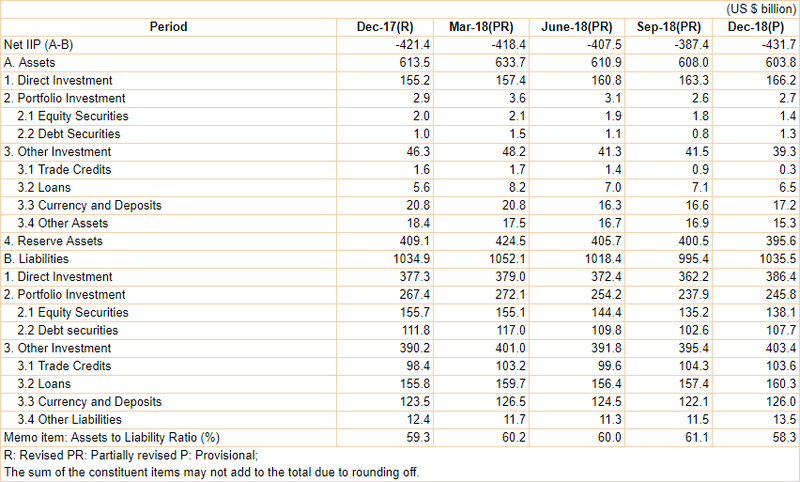 Mar 29, 2019: The Reserve Bank has released the data relating to India’s International Investment Position at end-December 2018. ‣ Net claims of non-residents on India increased by US$ 44.3 billion from their level a quarter ago (Table 1). ‣ The increase in net claims was due to a pick-up in foreign-owned assets in India after three consecutive quarters of contraction, combined with a marginal decline in Indian residents’ financial assets abroad. ‣ The large increase in foreign-owned assets in India emanated from inward foreign direct investment (FDI), followed by portfolio investment and currency and deposits. ‣ Overseas financial assets of Indian residents declined during the quarter, mainly due to reduction in reserve assets, even as overseas direct investment increased during the period. ‣ Appreciation of the Indian rupee against the US dollar during the quarter contributed substantially to the increase in net claims of non-residents valued in US dollar terms. ‣ Despite a decline during the quarter, reserve assets accounted for nearly two-thirds of India’s international financial assets (Table 2). ‣ The share of debt liabilities in total liabilities declined marginally during the quarter (Table 3). ‣ The ratio of India’s international financial assets to international financial liabilities stood at 58.3 per cent in December 2018 (61.1 per cent in September 2018). Note: India’s quarterly IIP is disseminated with one-quarter lag. The IIP for end-September 2018 was placed in the public domain on December 31, 2018.